While scores of books have been published about the atomic bombings that helped end World War II, little has been written about the personal lives and relationship of the three men that led the raid. Paul Tibbets, Tom Ferebee, and Ted “Dutch” Van Kirk exemplified what Life Magazine meant when in 1942 it called the B-17 pilot, bombardier, and navigator “the three musketeers of the Army Air Forces.” A former navigator-bombardier and pilot himself, Harder brings a fresh perspective to an otherwise well-known narrative. He provides a rare insider’s look at exactly who these three fellows were, how they were trained, what they meant to each other, and finally how everything coalesced into the Hiroshima and Nagasaki attacks. Published by the Naval Institute Press, Annapolis, MD. Hardcover, 2015. 288 pages, 30 B/W photos, 6 1/8" x 9 1/4" List Price $39.95. Air, Ground, and maintenance crews of the Enola Gay. Click here for bonus photos not appearing in book. Interview with the Smithsonian's "Air & Space Magazine"
or simply unknown to the public. This was especially the case with the B-52’s non-pilot, officer aircrewmen in the Vietnam War. "I learned more about the discipline and tactics of B-52 crews over Hanoi from this book than I did from flying the B-52 a decade later." TOM JONES--FORMER B-52D AIRCRAFT COMMANDER AND NASA ASTRONAUT. Published by the Naval Institute Press, Annapolis, MD. Hardcover, 2009. Softcover Reprint, 2013, 320 pages, 30 illustrations. List Price $24.95. Click here for bonus photos. Vice-President of the United States Hubert H. Humphrey presents USAF Second Lieutenant Robert O. 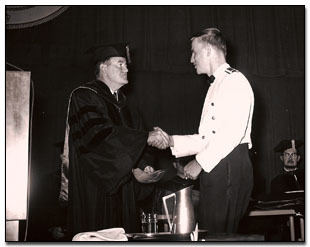 Harder with his graduation diploma during ceremonies at the University of Minnesota, Duluth on June 9, 1966.